People low the life that is brought into spaces by aquariums. However, may are scared of keeping the flowery fish alive or ensuring that there is no odor in the aquarium. You need not worry about the health of your aquarium. Here are tips that will ensure that your aquarium remains alive and fresh without costing you a fortune or taking away your peace of mind. Acclimatize your fish- this enables them to get used to your environment gradually. Inquire from the store about the conditions in which the fish should be kept. These parameters will help you ensure that your aquarium meets similar conditions. The conditions regard the concentration of ammonia, nitrite, pH and nitrate, among others. If the water at home differs greatly from the conditions given by the associate, you will need to take longer to acclimatize the fish. Provide Space– overcrowding is dangerous in an aquarium because it denies the fish the much needed oxygen. With overcrowding, you have to deal with excess waste, clogging of filters and degradation of water in the aquarium. This is also a leading cause of fatalities among fish. Talk to specialist about the right size of aquarium based on the size of fish and its growth habits. Ensure that the aquarium has enough space for the fish you put in it. Quality of water– fish are like human and other living organisms. They live in an environment that is extremely specific. Some prefer warm water while others are built for cold water. Other species are meant to live in salty water with many others preferring fresh water. Learn the mannerism of your fish to determine the quality of water you will provide. There biological aquarium elements and de-chlorination substances that are used to ensure that the quality of water is right. These properties will determine the quality of life in your aquarium. 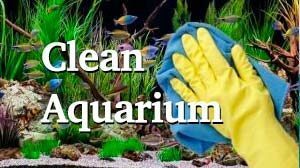 Clean the tank- do not bee fooled that everything green is right for your aquarium. Algae easily build up on the tank leading to clogging. This will cause the water to be murky and be depleted of oxygen. Algae also affect plants that are growing in the aquarium. Use a brush to scrub the sides and maintain the box clean. Learn as much as possible about aquariums and invite the veterinarian to monitor the health of your aquarium. Remember that fish are alive and require a clean living space. You will enjoy the fish swimming bubbly in their aquatic habitat when you provide the right environment.